Since I have a potato lover in the house and now with our weekly theme assignment it didn’t take long to come up with a couple of recipes to fill out the weekly menu plan and ultimately a keeper recipe. Now I have included a link to an interesting article, The Great Potato Debate: Healthy or Not from US News Wellness section…my downfall is excellent crispy hot french fries. 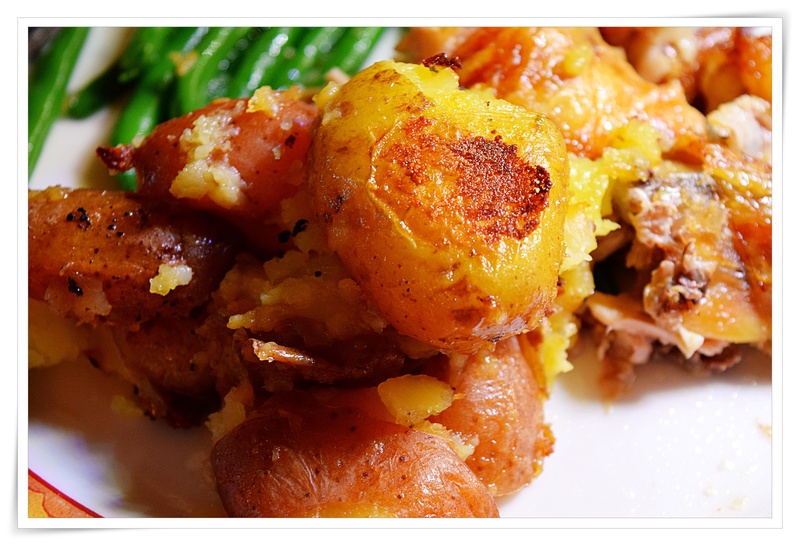 So many delicious potato recipes out there and no harm in having them once in a while. Well, two fantastic recipes perfect for holiday dinners, but tonight we just wanted a simple roasted chicken dinner and I headed to some of Jacque’s easy recipes to go with the chicken, smashed potatoes and green beans from Jacques’ Essentials surely to end up in my anytime and holiday go to files. Both recipes are easy and I did blanch the green beans ahead and finished them in the butter and shallots just before serving. Needless to say, I didn’t make the full recipe (1/2) for two of us with some leftover. I used Knorr concentrated stock which I think that is heartier than most stock that I have used. Place the potatoes in a skillet deep and large enough to hold all of the potatoes that you are making and add salt and pepper, to taste. Cover potatoes halfway with chicken stock, about 3 cups, add the butter and cover skillet with a lid. Cook the potatoes in the stock until almost tender, about 5 to 8 minutes, depending upon the size of the potatoes, (mine were that Little Potato Company brand and a mix of red and yellow potatoes). This harmonious combination of green beans, shallots, and butter is a winner. Try to get authentic haricots verts — thin, very young green beans — available in specialty food stores or at farmers’ markets, or choose the smallest, firmest regular string beans you can find. Make sure to cook them fully; they should be tender, not crunchy. Too often beans are just blanched, and their taste is not what it should be. Bring 1 1⁄2 cups water to a boil in a large saucepan. Add the beans and cook, covered, over high heat for 7 to 8 minutes, until they are tender but still firm to the bite. Drain the beans and spread them on a large platter to cool. At serving time, heat the butter and oil in a large skillet. When they are hot, add the shallots and saute for about 10 seconds. Add the beans, salt, and pepper and saute for about 2 minutes, until the beans are heated through. Serve. Previous Previous post: Potato What Soup?